Weddings are a great time to get crafty! One of the great things about this special event is that so many of the objects used during the ceremony or on the day of can be hand sewn as an extra special gift. You can add embroidery, appliques, or colors that match the wedding theme to make the gift unique and special. Homemade gifts are especially great for couples who are looking to save money or who have very specific wedding themes. Here's a list of some great wedding crafts you can sew! They include free patterns and directions. This ring pillow is unique and a great way to make sure the rings are not dropped by little fingers on their way to the ​altar. 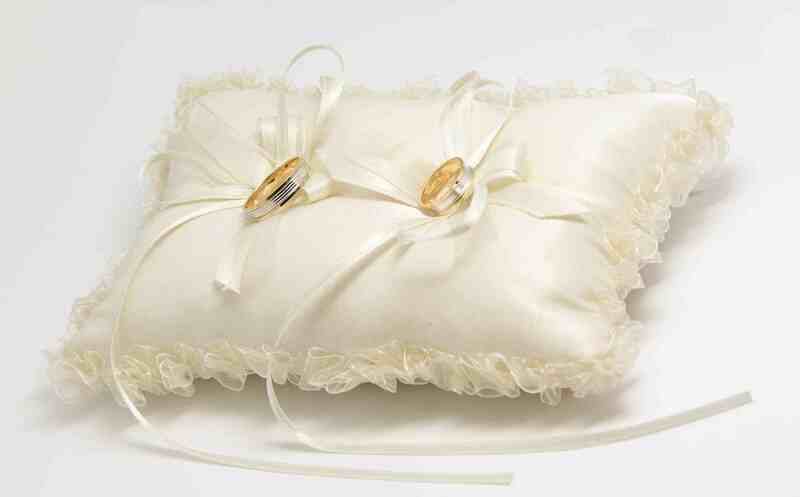 This pillow uses the ring box to hold the rings safely and securely. The number of ways this simple pillow can be personalized with fabric choice or a touch of embroidery is limited only to your imagination. Use these free directions to create a basic garter with lace, ribbon and elastic. Expand from there using the ideas to elaborate or use your own ideas and create a truly special garter, possibly two so the bride has one to save for her memory box. Wedding cards are a beloved tradition but with all the festivities it can be hard for the couple to keep track of them. This drawstring bag is an elegant convenient solution. You can add extra personalization with some embroidery or by choosing a themed fabric to match the couple. This simple pouch style purse is large enough for a small wallet and cell phone, the necessities of any date or formal occasion. If you or the bridal party need to carry more, enlarge the size of the circle to start the bag. Use the fabric scraps from the gown or dress to sew this pocketbook and have a totally matching outfit. This bag also makes adorable bridesmaid gifts! You can help your couple decorate their matrimonial bed with this adorable pillow. Follow these simple directions for this for this heirloom pillow front, and use a wedding themed embroidery. You could even use the couples names with their wedding date in the center for a memorable wedding gift. There are many choices to create any style of pillow using the free patterns and directions to sew pillows. This also makes a great anniversary gift! A perfectly tied bow doesn't have to just be for the wedding gifts. From hair ribbons to dresses there are lots of excuses for fancy bows at weddings. These bows are an excellent elegant detail to use on chair coverings. Follow these directions to help class up anything you need tied on that special day.